In January 2015, our brothers and sisters in Paris were trapped in a Kosher supermarket. Busy with the holy task of preparing for Shabbat, they found themselves trapped because of an Islamic terrorist. Throughout the Jewish world, hearts began to beat in unison as Ishmael came, once again, to let loose his arms. It is clear that the terrorist war is not only against Jews, France or caricaturists, but against the entire civilized world. Yet Western governments and corporations fail to perceive the obvious. French Jews have emigrated en-masse for several years now, but not all are able to leave their country. There are always family and financial considerations to take into account. However, Jews across Europe are on the alert and have an eye on the exit door. Today, Radical Muslims are gaining the upper hand in France, district by district, in the same streets where the Nazis swept away the Jews to deport them to the death camps. Neighborhood after neighborhood, jihadists are marching across Europe, sowing fear and terror across all countries. The Great Synagogue of Paris, erected in 1874, witnessed many events, both happy and tragic. Alfred Dreyfus, victim of a long forgotten anti semitic era, got married in this synagogue. The deportations orchestrated by the Nazis took place in front of this noble building. On a sad Shabbat in January, its doors were closed by order of the public authorities. The next day a spectacular meeting of world leaders took place, in protest against recent attacks and to insist on promises that were to be kept. Terrorists have now realized that a non-complex, large-scale attack allows them to cause the same trauma to society as a complex operation requiring sophisticated planning. French hospitality has been diverted and its weakness exploited. Jihadists applaud their savagery as a victory. With a relatively small military operation operated in two places by only three people, they were able to capture the world's attention and put fear in the hearts of men and women everywhere on the planet. No more hijacking planes, blowing up buildings, firing rockets, or soliciting masses for operations! Terrorist attacks, carried out by one, two or three people are easy to plan and have shown that they achieve the same media result as larger attacks. Thus, it only took a few individuals to paralyze the whole world and focus all their attention. On Thursday, they killed twelve journalists and a police officer. On Friday, dozens of hostages were held in a Kosher supermarket. Four Jews died in this attack, just because they were in a Kosher shop for their Shabbat preparations. Jews around the world heard the news on Friday morning. As they prepared for the day that is "Mein Olam Haba", they were confronted with the worst reality of "Olam Hazeh". The dichotomy of good and evil, temporal and eternal, Olam Haze and Olam Haba, was clearly brought to light. There is now a heavy concern in France and around the world; people realize that there are some amongst them, born and raised on the same soil, who despise them, despise their culture, and are willing to kill and die to achieve their goals. Defeat and apprehension reign as millions of people realize the fragility of the freedom we all took for granted. Millions of people have taken to the streets to express their sadness at the tragedy and their concern for the future. Given the large numbers, there is a certain comfort in knowing that the French people and the world finally recognize the precarious situation in which the world has been plunged. Nevertheless, entire neighborhoods in France are now complying with Sharia law. Jews do not feel safe, and the government has so far not brought back the confidence of this "besieged" community. France is home to the largest Jewish community in Europe, which represents the third largest concentration of Jews in the world. However, it was not until 2014 that the national railway company signed an agreement to compensate Holocaust victims living in the United States and Israel. Similarly, it was not until 1995 that France officially recognized its role of assisting the Nazis in the deportation of hundreds of thousands of Jews. When French President, Jacques Chirac declared that his country had participated in the genocide, he finally concluded decades of legal controversies and emotional charges. The French Jewish community is made up of descendants of Holocaust survivors and refugees from Arab countries who regained their independence where Jews were persecuted. Everyone is aware of the precariousness of the Jewish people in Gola, (exile). This feeling was only reinforced when the French authorities closed the Jewish shops during that sad Friday in January, and demanded that the synagogues remain closed on Shabbat because they could not guarantee the safety of their Jewish citizens. But this is not necessarily a French problem. It is a global problem. Glory and tragedy are mixed into the fate of the Jews in Europe. In good times, people tend to forget how much Jewish blood has flowed on European soil during the last thousand years of exile. Regardless of the different forms or pretexts of the persecutions, the color of the flags worn by the killers or the slogans they chant, the result have always been similar. The Jews were driven from their homes, and fled death and destruction by escaping to a new foreign land. Uprooting is never easy and it always pays a heavy price. Western leaders have hoped that the war against Islamic radicalism could be settled with fine words and gestures of goodwill. They thought they could triumph over their liberal ideology by making compromises on various fronts with jihadists. They negotiated with Iran, made concessions with the Taliban, and believed that by pampering the Radicals and surrounding them with their good care, they would achieve peace. They have however, not taken the rise of radical Islamists seriously enough and have continued to treat the issue as simply a matter of public security, when the stakes are in fact existential. They force Israel to compromise with terrorists who want only the destruction of the Jewish state, naively thinking that arrangements can be made with people who kill and die in the name of hatred. Terrorists are aware of this and are encouraged by their rise to power. Jewish blood has flowed millions of times, and each time we are reminded that we are still in exile. Each time we get up and continue to move forward. We find the inner strength to persevere and continue our march towards the finish line, with our heads held high and our hope intact. Three simple words captivated France and the world after the attack on the publication of the satirical newspaper Charlie Hebdo: "I am Charlie". Millions of people around the world marched under banners sporting these three words. In times like these, we must realize that "I am Jewish", or "We are all Jews". We must feel the pain of Jews wherever they are and where they suffer. We must try to imagine their worries and their fear. (Editor's note: the author of the text is American). When we walk quietly to the synagogue on Shabbat, let us have a thought for those who have to hide themselves so as not to draw attention to themselves or their religion. When we shop, we must think of those who risk their lives when they go shopping for Shabbat. No Jew is alone. No Jew should feel alone. I am Jewish. We are Jewish, and Jews are united around the world. For better and for worse, we are one. Let us make sure that nothing and no one can divide us. It is essential that we feel solidarity with one another. We must seek to get closer to each other and to console one another. We have to welcome those who seek comfort. No one should feel abandoned, drifting or isolated. Many Jews do not feel safe. Many are extremely worried and disturbed. Many are sick with worry. Where can we go to be safe? Where can we catch our breath? Let us examine Parshat Shemot, and remember the first Jewish exile. A family of seventy people arrived in a foreign country because of a famine in their home country, Eretz Yisrael. They were lead at the time by their grandfather, Yaacov, and his twelve sons. But things didn't go well. As the family grew, they became the object of growing hatred. Finally, they were subjugated as slaves by the king and his people. These slaves knew who they were, where they came from, and how they had arrived in this country. They knew perfectly well the promises G-d had made to their ancestors Avraham, Yitzchak and Yaacov. They were certainly encouraged by the fact that G-d had predicted to their ancestors that their grandchildren would be tormented by a foreign power but that they would eventually be released. They knew who Moshe Rabbeinu was. They knew about his nobility. They knew that he had grown up in Pharaoh's palace. People who are imprisoned, generally cling to any sign of hope. They listen to rumors and stories that give them hope and help them think that their freedom is near. Therefore, when we learn Parshat Shemot, we may legitimately ask ourselves why the Bnei Israel did not listen to Moshe when he appeared to them and told them that their long-awaited salvation was near, using the four verbs of Deliverance, the Geula. Indeed, the precise verse states, (Shemot 6, 9): "... and they did not listen to Moshe". Why did these poor oppressed people not seize this opportunity? Not only that, but in Parshat Shemot, the verse (5, 29-31) reports that Moshe and Aharon gathered together the elders of the people, and told them what Hashem had said to Moshe and they performed miracles to prove the truth of their words and the authenticity of their mission. The verse says that "the people believed and heard that Hashem had remembered them and their situation, and they prostrated themselves'', in acceptance. What is the difference between this moment and today? One verse in Parsha Vaera (6: 9) explains why they did not listen to Moshe's prophecy: it was because they were "Mikotzer ruach umeavoda kasha". Rashi explains that enslaved people are like a person in distress who suffers from breathlessness. In other words, they did not listen to Moshe because of their tragic situation and their exhausting work. The Ramban explains that their inability to accept Moshe's words was not due to the fact that they did not believe Hashem and His prophet, but rather because they were plunged into terrible suffering - Kotzer Ruach - and that they feared that Pharaoh would kill them. "Umeavoda Kasha" refers to the fact that their supervisors tormented them and did not let them pay attention to what was said to them. They just did not have the luxury of a quiet time to listen. As clear and objective as these explanations are, we always wonder what the people thought of as they dragged themselves into their tents every night, exhausted. Peace of mind or not, did they not miss something crucial? Didn’t they wonder about Moshe and his predictions? When they lay down on their mattresses, did they not think that perhaps there was some truth in his prophecy? Rav Gamliel Rabinowitz links the Kotzer Ruach and the Avoda Kasha to the elements that make up a person. There are three Madregot (spiritual levels) commonly called Nefesh, Ruach and Neshamah. The lowest level is Nefesh, which refers to the physical attributes of man and his ability to perform physical work. Ruach is his ability to speak, which distinguishes him from an animal, as Targum Onkelos teaches us. The highest form of Ruach consists of uttering words of Torah and Tefillah. The Neshamah is the highest level of man because it refers to his spirituality. Perhaps here we can understand the verse that explains why the B'nai Israel were not moved by Moshe's prophecy. Their Avoda Kasha, their grueling physical work, caused a real inability to hear by depriving them of the attribute of Ruach. Their hope was extinguished. And without hope, there is no possibility of life. When hope dies, the body becomes insensitive. Without hope, there is neither vivacity nor longing. A person who is plunged into apathy, depression and despair cannot be touched by anything unless their hope is first restored. Ruach is indispensable to anyone who wants to hear words of Tachanun, who wants to understand what the prophets say, and who will accept to be delivered. As Rashi says, a breathless person cannot accept words of comfort. But this state of breathlessness is due to a lack of Torah and Tefillah. This is how we can understand the words of our Sages: "Ein Lecha Benei Chorin Ela Mi Sheossek Batorah" - "There is no free man except one who devotes himself to Torah". Whoever uses his time to learn Torah becomes receptive to true freedom, enrichment, and happiness. Whoever learns Torah is blessed in all his choices. Insofar as a person submits his Nefesh to his Neshama, he is able to gain happiness and pleasure. The Mishnah teaches: "Kol Halomed Torah Lishma Zoche Ledvarim Harbe" - "Anyone who learns Torah selflessly deserves many rewards". One of these rewards is that "the whole world will be worth it for him". The literal understanding of the Mishnah is that it was worth creating the whole world just for him. Commentators ask about this reward. What kind of reward is it for a person that the whole world was created for him? To answer this question, they emphasize that the Mishna uses the adjective "Kedai", that is to say that the world is "valid" in the eyes of this person. In fact, this person will be able to enjoy every experience. They will live every moment to its maximum and make the most of each encounter, because the Torah raises and develops a person to the point that every moment of his life is worthy of consideration and celebration. Rav Nathan Muller, one of the luminaries of the Chinuch world, is the much-appreciated director of Yeshiva Torat Emet in Brooklyn. When he was a Bachur in Mir's Yeshiva in Jerusalem, he had a Havruta every Friday night with his Rosh Yeshiva, Rav Natan Tzvi Finkel, which he cherished very much. Once, when they were learning Parshat Vaera, he showed his Rav the explanation of the Or HaChaim Hakadosh on the above idea. The Or Hachaim Hakadosh writes that the Bnei Israel did not have the tools to rise above their distress because they had not yet received the Torah. He goes on to say that the Torah "develops the heart of a person", that is, develops the person by allowing him to have a place in his heart for something other than intense suffering and anguish. 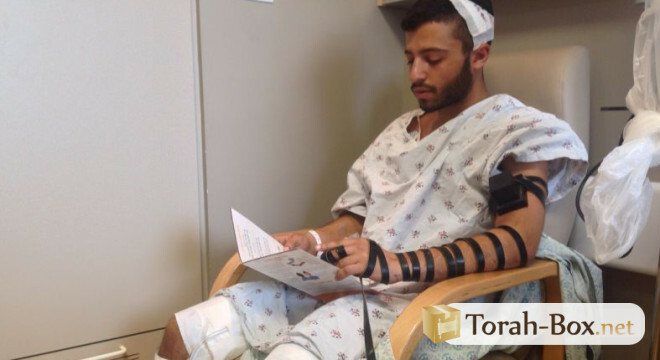 The Rosh Yeshiva, who knew what it meant that the Torah could lift a person above his pain, appreciated the idea and thanked his pupil. Years passed. Rav Muller got married and moved to Lakewood, where he became a renowned Rav. Nine years after the famous Friday night, Rav Natan Tzvi was visiting Lakewood and Rav Muller was eager to introduce his students to the Rosh Yeshiva. He received an appointment for a Friday afternoon; erev Shabbat, Parshat Va'era. Rav Natan Tzvi first spoke with the Bachurim, and he then had a private conversation with his pupil, Rav Muller. He remembered with nostalgia the Chavruta session that they had had nine years earlier. Rav Natan Tzvi suddenly interrupted him: "Are you trying to remind me of the teaching of the Ohr Hachaim Hakadosh? Do you think I forgot it?" Kotzer Ruach is caused by not learning Torah. Raising one's Ruach to the highest level by learning Torah does not only add power one's speech, but also improves all aspects of one's life. As King David says: "Torat Hashem Temima Meshivat Nafesh" - "The Torah restores the person's Nefesh, as well as his energy and joy". Last year, Rav Chaim Kanievsky sat Shiva following the death of one of his beloved daughters. At the conclusion of the week of mourning, he joined the family at the deceased's grave, as tradition dictates. The eminent Israeli photographer Shuki Lehrer showed ingenuity and imagination as he stood near the tomb, as he was determined to take a picture of Rav Chaim. He explains, "I knew that Rabbi Chaim had been deprived of his usual Torah schedule during the week of Shiva." I understood that he would be thirsty for Gemara, and I knew that as soon as the week of Shiva would come to an end, one of his grandchildren would bring a Gemara to the cemetery and give it to Rav Chaim when he came out. I wanted a picture of that special moment as it happened. Indeed, Rav Chaim took over the already open Gemara, and his face lit up, and he immediately returned to the world where he is happiest." 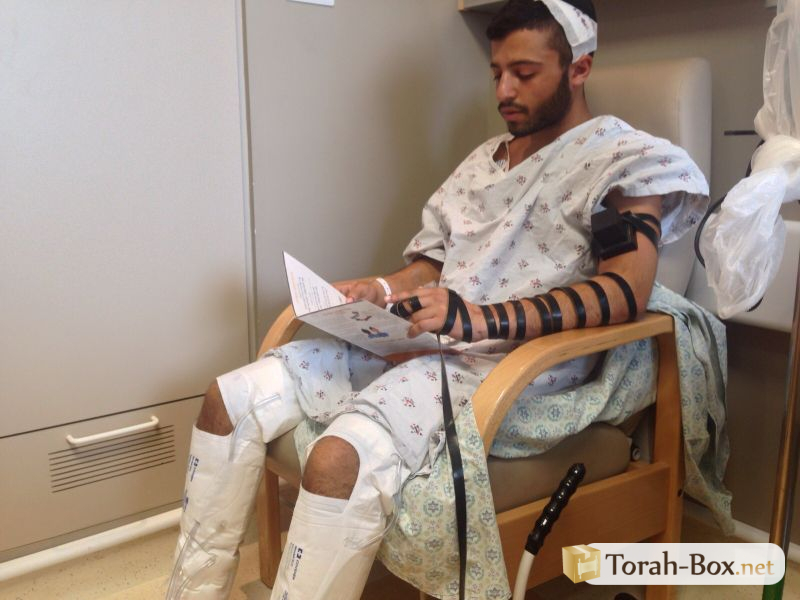 If this story underscores the inventiveness and skill of a photographer, it certainly brings out the best possible testimony of the Torah's ability to soften the Nefesh, broaden the reasoning, revitalize the Ruach and allow man to transcend suffering. Rav Yitzchak Hutner evokes the term chosen by David Hamelech to qualify his pleasure in the Torah: Shaoshuai (literally "my toy"). A child playing with his favorite toy smiles and shines with grace, because at this moment he is really himself. He is not engaged in a quest that leads him elsewhere. He does not seek to earn money, or power. It only expresses an essential desire. There is nothing cynical or calculated in his action; that's why people who see him playing, smile at him. The sight of a little boy guiding his fire truck along a road, or a little girl putting her doll to bed touches us because we recognize the purity of their actions. The Torah is our Shaoshuai. It is the place where we really find ourselves. It is through the Torah that we can get in touch with our true selves, and it is where we find our hope. The weapons are always pointed at us. Hatred and anger have always been directed against us, as they are today. Throughout the ages, we have been victims of disappointed, angry people. Yet we have endured it all. How did we survive? What is the secret that keeps us strong, confident and victorious despite the many enemies and Kalashnikovs pointed at us? Parshat Vaera directly provides the answer to our endurance. Only by learning the Torah do we raise our spirits. As they try to quell our Ruach, we respond with even more vitality, more energy and more toil. When Hashem asked Moshe to convey to Pharaoh the message of the deliverance of the Jewish people, Moshe initially opposed it: "The Jewish people did not listen to me, how will Pharaoh listen to me?" (Shemot 6, 12). Rashi specifies that this is one of the ten cases where the Torah uses a Kal Vachomer argument. The answer is obvious. The verse explains that the B'nai Israel did not listen to Moshe because of their Kotzer Ruach and their Avoda Kasha. However, Pharaoh, who was seated safely in his comfortable palace, did not have these limitations. Why was Moshe convinced that they would not listen to his arguments? If we understand Kotzer Ruach as referring to a lack of Torah and Madregat Ruach, then that is quite understandable. The B'nai Israel, heirs of a noble tradition, were weakened in their study of Torah and were therefore not receptive to the messages of freedom and hope. Pharaoh, who was not part of this tradition and had never learnt Torah, could surely not be receptive to a tender humanitarian message. We cry in Selichot: "Veruach Kodshecha Al Tikach Mimeni" - "Hashem, please, do not take away from me Your healthy spirit". We can explain that this prayer is also a demand that our Ruach, our spirit and our hope, remain holy and blessed, through the merit of the Torah. We seek to deserve the blessings of the prophet Yeshayahu (59, 21) who predicted: "Ruchi Asher Alecha Udevarecha Asher Samti Beficha Lo Yamushu Mipicha Umipi Zarecha Umipi Zera Zarecha Meata V'ad Olam' - "My inspiration which rests on you and the words which I put in your mouth, they must not deviate from your mouth, nor from the mouths of your children, nor those of the children of your children, neither now nor in future times ". The period known as Shovavim (whose name is formed by the initials of the Parshiot that we read between Shemot and Mishpatim) is a particularly favorable period for Teshuva and spiritual enrichment. As these Parashot evoke the descent of Klal Yisrael to Egypt, and then their redemption, it encourages us to free ourselves from our personal prisons and our own slavery. Repentance is acquired through acts of charity, fasting and affliction. Amelut Batorah, the intensive study of the Torah, also has the power to cleanse and purify. The Shovavim period is also a good time to add fervor and zeal to our learning. We once described what happened when the Rogatchover Gaon was walking in the street. The coachmen stopped their horses, waiting to see him pass. The peddlers stood upright and attentive. The salesmen stopped their heckling. The Rogatchover Gaon was so engaged in his study of the Torah and so unaware of his environment that he united people of all kinds in a respectful and emotional silence. He embodied the Ruach of the Torah. We must breathe deeply and fight for each breath, because we live in a time when Ruach is insufficient. We are in a state of Mi Kotzer Ruach. In recent months, we have often held our breaths, more often tragically. Mikotzer Ruach. We saw some Tzaddikim murdered because they were Jewish, and young boys kidnapped and killed because they were Jewish. Mikotzer Ruach. In January, we collectively held our breaths when our brothers and sisters were held hostage in a supermarket in Paris. Mikotzer Ruach. We lost our breath when we learned that four innocent hostages had been coldly shot. Mikotzer Ruach. But there is also Meavoda Kasha. As the grip of exile narrows, it becomes harder to focus on what we need to do to regain our breath and joy of life. We must strive to work harder to raise our Nefesh, our Ruach and our Neshamah to higher levels, so that we can breathe more easily, more surely and at greater length, and so we can merit the Geulat Hanefesh (deliverance) of the spirit) and the Geulat Haguf (deliverance of the body), soon thanks to the Torah. Jews were attacked while preparing for Shabbat, as a symbol of a generation preparing for the ultimate Shabbat, the Yom Shekulo Shabbat (day of rest), a frenzy of final tasks among the sirens. We are in the last moments before the arrival of Moshiach. The news channels reported that the police forced the doors of the Hyper Hide on Jean de la Fontaine Street at sunset, at the time of Shkia. Thus, the siege ended when Shabbat began. Chevlei Moshiach are painful. We are waiting for the day when the end of the siege of this exile will be born. A study carried out at the Department of Scientific Information of Bar Ilan University came up with an additional reason to limit the use of the Whatsapp instant message application.